Wherever we are we love taking our favorite music with us - our playlists that reflect our current mood the best. If you have SyncMate, you won't need to create the same playlists on every device you own. You can sync your favorite iTunes playlist from Mac to Android tablet and phone and always have it with you. 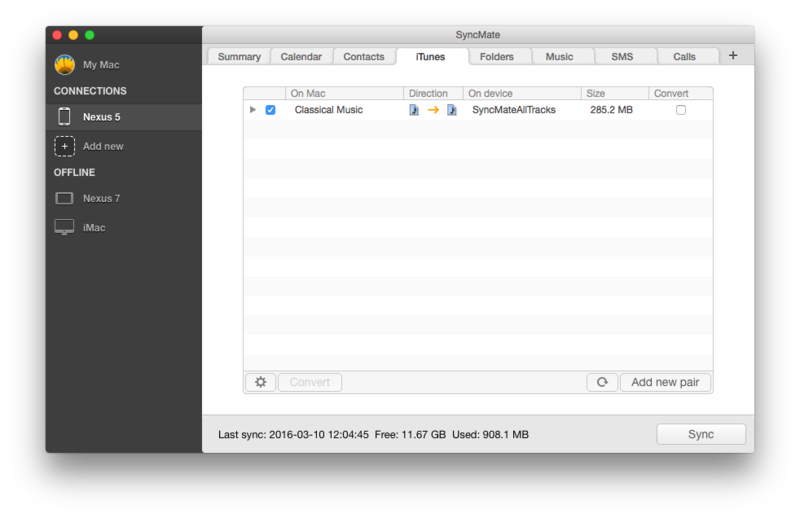 SyncMate is a multipurpose sync tool for Mac and Android phones or tablets. With SyncMate Free edition you can sync contacts and calendars on Mac with their analogues on Android. SyncMate Expert offers more sync options and syncs images, videos, music, folders, and lots more between Mac and Android. Read more about Android & Mac synchronization here. Download SyncMate, install it on your Mac and launch. iTunes sync plugin is available in Expert edition, so you will need to upgrade. This can be done on our website (we recommend you to test SyncMate Free Edition, which allows syncing contacts and calendars, prior to upgrading to Expert). Click ‘Add New’ link in the left pane and choose Android device; connect it to your Mac. Press "+" button in the top panel and choose “iTunes” from the plugins list; specify sync parameters. SyncMate Expert will sync existing iTunes playlists on Mac with playlists on Android (existing ones or you can create new playlist on Android directly from SyncMate). 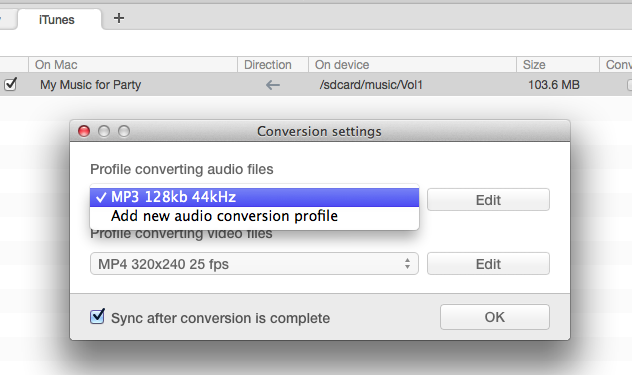 You can tune audio and video conversion settings if that is required. 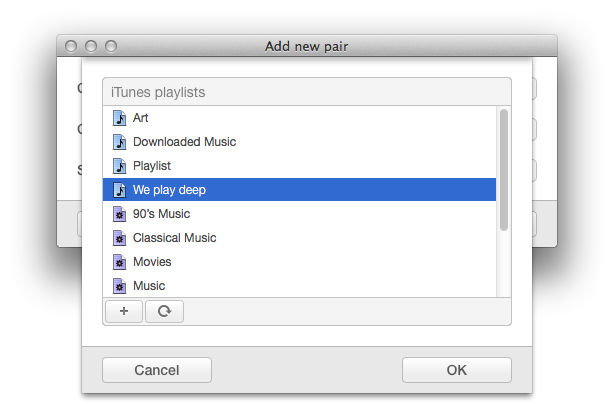 When all these parameters are set, select the synchronization pair in the list and click “Sync” - playlist you’ve chosen will be synced between Mac and Android. 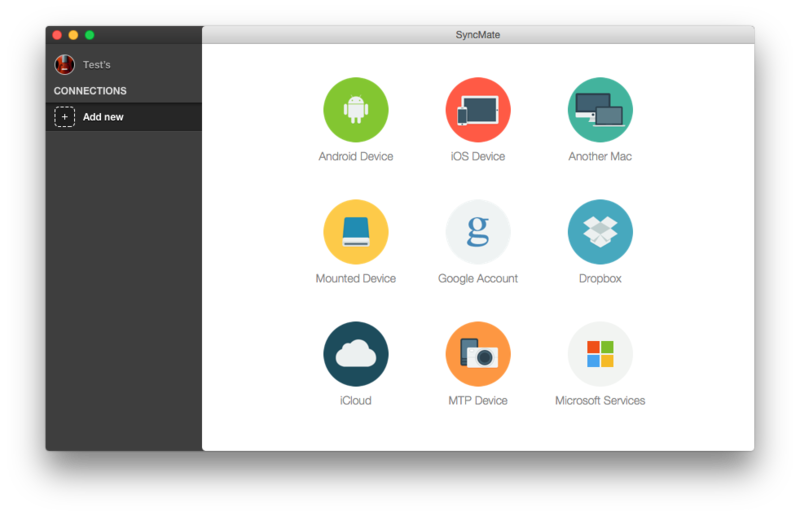 Android devices are not the only ones you can sync your Mac with using SyncMate. You can also sync your Mac with iOS phones and tablets, other Mac computers, online accounts and storages (iCloud, Google, Dropbox), Windows services (Outlook, Office 365 Home and Business editions). More about supported devices/accounts and sync options for them here.